TireShop is an auto-shop management and point of sale (POS) system for single or multi-location tire and auto-repair shops which incorporates open order listing, work order management, quick quoting, tire inventory management, customer relationship management, and reporting functionality. TireShop aims to deliver all the tools required to manage tires, repairs and quick-lube processes online. TireShop’s interface allows users to input data with a keyboard, mouse or touchscreen. TireShop’s CRM system, forms designer and appointment calendar helps users manage customer marketing, invoicing and scheduling activity. Users can manage receivables through TireShop, and utilize QuickBooks integration to process payables. The built-in time clock allows users to clock in/out and track employee hours. Features such as VIN scanning, customer histories, and credit card processing allow users to manage sales activity. Users can manage tires, repairs and quick-lube with quick tire quoting, courtesy checklists and oil change prompts, and more. Categories, transfers, and reorder reports help users control inventory processes, while custom price levels and automatic matrix pricing technology allows users to manage pricing information. It is easy to set up and train new users on. We made the decision to buy the program mid- November of 2011 and we were live with virtually no problems on January 3, 2012. The customer service team is super responsive. Integration with contract service companies such as DOT # capture, Goodyear sell-out data, etc. is easy. It has virtually everything you can think of to help you sell tires and service as well as managing your business to the max. If there are any negatives, they are, in my mind, buried by all of the positive aspects. I only wished I had purchased this system sooner. Easy to use and still powerful.Easy to use and so easy to track what used to be hard to find issues on our previous software. We get great support from the TireShop by FreedomSoft I have recommended TireShop to many other shops and they have all been pleased with it too. They work with us to use our ideas for improvements too. We are in the lawn equipment business too. They have helped us customize this but it can't integrate with the Outdoor Power Industry like it does the automotive. Easy to use and so easy to track what used to be hard to find issues on our previous software. 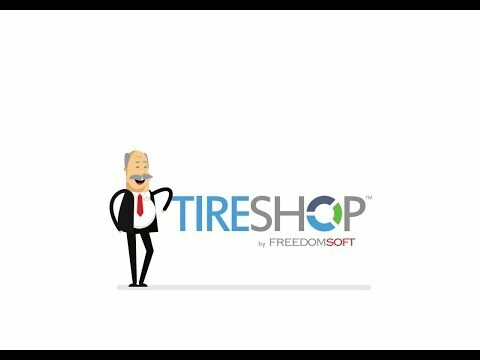 We get great support from the TireShop by FreedomSoft I have recommended TireShop to many other shops and they have all been pleased with it too. They work with us to use our ideas for improvements too. We are in the lawn equipment business too. They have helped us customize this but it can't integrate with the Outdoor Power Industry like it does the automotive. We have used Tireshop in all 6 of our locations since 2006, 100% pleased with this software! Tireshop does it all for us. It is very easy to learn initially, and very robust in it's functions as you call on it for more and more. We have been recommending this product to anyone that inquires as to what software platform we are utilizing. We like it all. Honestly can't come up with a single issue that could be improved. They have taken many steps to add new functions and keep ahead of industry trends. Works great for multi store function, inventory control is easier than our last system. Company is very good at tailoring it to users. I wish it had any inventory scanning program. I wish it had tighter controls for inventory entry, keep everything more uniformed. Thanks for the feedback. Inventory scanning is one of our latest features and is currently being rolled out. We would love to get your input on it after you've had a chance to try it out. We have been a user since 2004 and the experience has been great! We save money on the support package. and we never have any downtime.Speed, ease of use and you can call for support, talk to an English speaking human and they resolve the issue, which happens very seldom. They download regular updates and the maintenance is very affordable. Speed, ease of use and you can call for support, talk to an English speaking human and they resolve the issue, which happens very seldom. They download regular updates and the maintenance is very affordable. The pricing module isn't very clear. I opt to do it manually, but I'm sure I just don't understand it and I have never taking the time to ask about it. Contact FreedomSoft directly for detailed pricing information. Supports multiple integrations to help users streamline sales, inventory and accounting activity, including QuickBooks, CARFAX, EPICOR, IAP and Tire Wholesaler integrations. User tracking and permissions functionality helps users to control employee access levels and monitor suspicious activity. Process credit card payments through TireShop using integrated credit card partners such as XCharge. Reporting capabilities give users actionable insight into business sales, finances, activities, vendors, employees, customers, and more. Offers a mobile-friendly solution which allows users to access information and manage activity on the move from any internet-enabled mobile device. Below are some frequently asked questions for TireShop. Q. What type of pricing plans does TireShop offer? Q. Who are the typical users of TireShop? Q. What languages does TireShop support? Q. Does TireShop support mobile devices? Q. Does TireShop offer an API? No, TireShop does not have an API available. Q. What other apps does TireShop integrate with? Q. What level of support does TireShop offer?